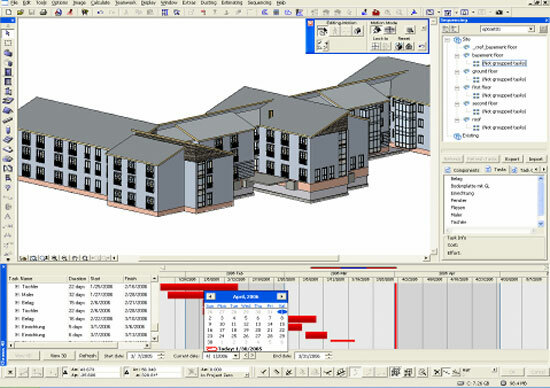 Now-a-days the various new aspects of BIM are emerging out. How BIM and 4D scheduling can bring huge benefits to construction safety, is the most controversial topic of today. There exists several incorporated technological and management practices which are associated with the site safety. At the initial stage, BIM comes with supreme accurateness and self-reliance in project documents which consecutively speed up the prefabrication process, minimize the time spent on site as well as reduce the possibility of on-site accidents. 4D scheduling facilitates the designer and project stakeholders to detect collisions at the initial design phase and examine congestion and accessibility more efficiently as compared to standard Gantt charts. The most striking features of 4D schedules are that, they are different from a static building model and remain in a dynamic state; identical to the building itself. By relating time to structural components, a structural engineer gets the ability to perform structural analysis associated with time through the actual BIM model. If this is undertaken at initial design stage, it may find out the desirable material and the construction methodology with the purpose of saving time and money. 4D construction conflict management analysis. 4D layout collision analysis and management. It is assumed that these types of extensive rules for 4D scheduling could significantly enhance the safety inside the construction industry. BIM contains algorithms to produce rule based checking systems for safety which is the prospect of this technology. The algorithms entailed on the basis of existing legislation and best practice. As for instance, 4D scheduling of definite site risks, may imply warning signage or tape or in the case of more serious risks, handrails.